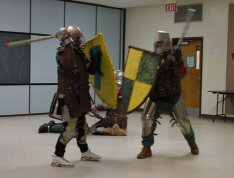 The Barony holds fighter practice in Lusby at the Southern Community Center. We usually have 5~6 fighters to play with, bring your armor and come play. If you are new the the area/SCA, or just interesting in finding out what it is all about, drop by too! We have several sets of loaner armor if you would like to try it out, but the armor is not brought to practice unless requested. Get in touch with the Quartermaster at Quartermaster AT DunCarraig DOT net to arrange for it to be there. At practice those not interested in the martial arts also gather to practice more peaceful arts as well as socialize. If you are over 18 and would like to try out fighting, there are 3 things you need to bring with you; Photo ID, Groin Protection (a baseball cup works good), and most important is a good attitude. This will NOT be a "trial by fire" or a "beat on the new guy", we truly would like you to come back again. We'll teach you the basics, then start out slow and continue to teach as you go. LADIES, fighting is not only for the Lords, you too can come join the fun! For those under 18, you can fight there is just more paperwork that needs to be done, so bring a parent and come visit us. If you have any questions about Heavy Weapons / Armoured Combat, please feel free to email the Knight Marshal at KnightMarshal AT DunCarraig DOT net. Please wear non black soled/non marking shoes as the Community Center has requested. Below are links to many different sites which supply arms and armor. These are sites which the fighters of Dun Carraig have used, and have found to sell decent equipment at a decent price. If you find bad links, or have other sources to add to this list please let the Web Minister know at WebMinister AT DunCarraig DOT net. Has a nice armour. Not the cheapest, but fairly good. Has a large supply of cut or uncut links in a variety of diameters, thicknesses, and metals to make Chain Maile. Has a wide variety of Leather, Leather working tools, paints, rivits, buckles, and more. Another resource for Armour Research, and has a good list of patterns (External Link).